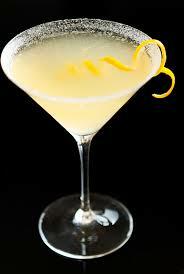 Lemon Drop Martini Recipe and Shot Recipe from Real Restaurant Recipes. Apparently a California bar introduced the Lemon Drop Martini Recipe in the 1970's trying to market themselves to "California Girls." The drink is now a favorite Martini recipe on the west coast. You can serve this cocktail recipe with ice as described or "up" (without ice). To make a sugar-rimmed glass, rub the drinking surface of the glass with a lemon wedge to moisten and dip the edge of the glass into sugar or chill your martini glass first and then dip the edge into the sugar. 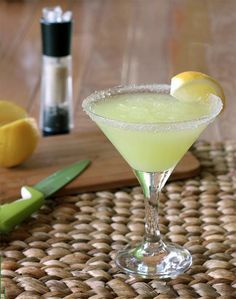 Enjoy your Lemon Drop recipes and the company of those you share them with! Did you know? 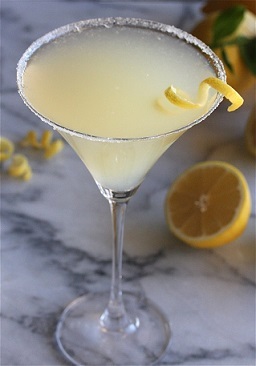 The Lemon Drop cocktail was first served at a single's bar called "Henry Africa's," located in San Francisco. This bar was well-known for serving sweet alcoholic beverages in order to attract female customers.